The lava flow that originated from Mt. Fuji about 10,000 years ago and flowed upto the present day Mishima City is called the Mishima Lava Flow. This lava forms a major part of the city’s surface between the Kise and Daiba Rivers. Ground water flowing through crevices inside this lava gush out in various places all around Mishima City. The Komo and Kohama ponds located on the premises of Rakujuen Park are fed by this water. 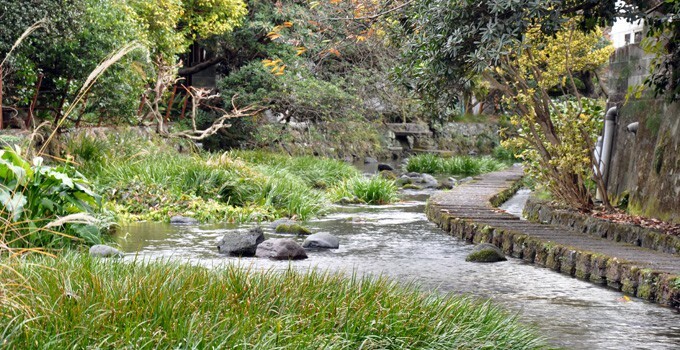 Flowing water also crisscross the city landscape in the form of small rivers such as the Genbeigawa. The surface of lava flow in Rakujuen offers a view of its intriguing structure– resembling a labyrinth of interwoven ropes. Visitors can use the parking lot of the Rakujuen.